Sad to say, but the 2010 college football season is in the books. The Auburn Tigers are living the life of the amateur champs – Johnny Carson, trips to Disneyland, PSA commercials about sportsmanship. 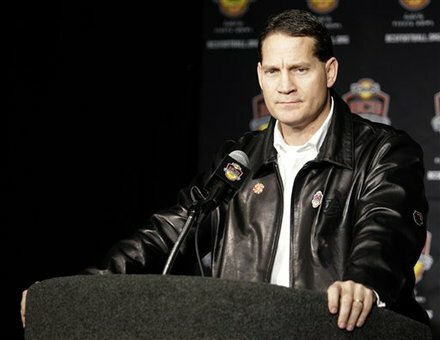 Meanwhile, the rest of the college football world is left wondering how the hell Gene Chizik won a national championship. While the Tigers are enjoying the spoils, let’s turn the page to next year. rankings reflect a power poll, i.e. the teams are ordered based on highest likelihood of beating everyone else. Honestly, I looked high and low for a reason not to rank OU No. 1. The Sooners return 17 of 22 starters from a 12-2 team that won the Big 12. The Sooners also managed to exorcise some BCS demons by pounding the Connecticut Huskies in the Fiesta Bowl. Bob Stoops’ squad won’t be heads and shoulders above the rest of the field, but it looks like the top dog for now. For better or worse, the Mad Hatter will return to Baton Rouge in 2011 to coach one of the most talent-laden rosters in the country. Coach Les Miles and Gary Crowton have to decide if Jordan Jefferson is still the long-term answer under center. Even with that uncertainty, LSU has enough talent to challenge for the whole ball of wax. Coach Nick Saban has his program running in tip top shape these days. The Crimson Tide is loaded with studs at just about every position, and the team’s stellar coaching staff emphasizes a physical brand of football that few opponents can withstand for 60 minutes. ‘Bama loses RB Mark Ingram, QB Greg McElroy, WR Julio Jones and DL Marcell Dareus, but there are more than enough young ballers waiting in the wings to step in. Suspensions aside, Jim Tressel should have a typically sound team ready to go in the fall. Terrelle Pryor gets the headlines, but it’s the Buckeye D that keeps OSU humming along. In what should be a down year in the Big Ten, Ohio State could be undefeated heading into bowl season if the second team can muddle through the first five games. Close, but no cigar for the Ducks in 2010. Darron Thomas and LaMichael James will struggle in 2011 to match the numbers they generated on offense this season, especially with personnel hits coming on the offensive and defensive lines. This will remain a dangerous team. Just not quite as dangerous as this past season. The rest of college football should take notice of the job Jimbo Fisher and his staff are doing down in Tallahassee. The ‘Noles are starting to stockpile talent like Dadgum did in his heyday, and they have coaching to match. FSU looks ready to make the leap in Fisher’s second season. No one knows what to expect out of the Gamecocks anymore. Are they the stone-cold dudes who roughed up ‘Bama by two touchdowns at midseason? Are they the callow bunch who let Auburn steal their manhood in the SEC title game? With Marcus Lattimore and Alshon Jeffrey still in the fold, this may be the year South Carolina breaks through. Watching all-star QB Andrew Luck and Co. take Virginia Tech apart in the Orange Bowl last week, the impact of dynamic coach Jim Harbaugh on the program was never more evident. Luck coming back helps, but losing Captain Comeback to the San Francisco 49ers feels like one of those crippling blows that up-and-comers don’t often recover from. Time – namely the 2011 season – will tell. Now, we’re starting to stretch some. A&M finished the regular season in fine fashion, but the Cotton Bowl contest versus LSU exposed many of the flaws seen in Mike Sherman’s teams in recent years. DE/LB Von Miller has used up his eligibility, along with a number of other starters in the front seven. Defensive coordinator helped A&M make major improvements this season, but will they carry over when teams begin to adjust to his 3-4 scheme? If I didn’t lose you with A&M, I suspect I have now. Bear with me, though. With coach Mark Richt likely coaching to save his job in 2011, I suspect he and his staff will be laser-focused on a big campaign. UGa still has plenty of talent dotting its roster, and their youngsters saw meaningful action this season. Freshman QB Aaron Murray definitely took some lumps in 2010. Yet, he has the makings of a star.